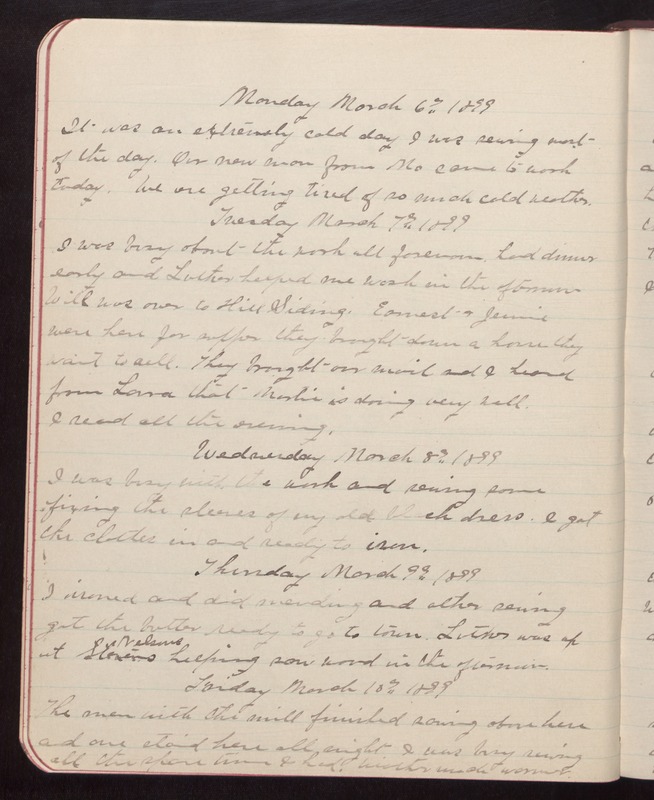 Monday March 6th 1899 It was an extremely cold day I was sewing most of the day. Our new man from Mo came to work today. We are getting tired of so much cold weather. Tuesday March 7th 1899 I was busy about the work all forenoon. had dinner early and Luther helped me wash in the afternoon Will was over to Hill Siding. Earnest & Jamie were here for supper they brought down a horse they want to sell. They brought our mail and I heard from Laura that Martin is doing very well. I read all the evening. Wednesday March 8th 1899 I was busy with the wash and sewing some fixing the sleeves of my old black dress. I got the clothes in and ready to iron. Thursday March 9th 1899 I ironed and did mending and other sewing got the butter ready to go to town. Luther was up at Nelsons helping saw wood in the afternoon. Friday March 10th 1899 The men with the mill finished sawing above here and one staid here all night. I was busy sewing all the spare time I had. Weather much warmer.